Please, note that the flavor of these sticks is noble, genuine and pleasant, and nothing to do with the cheap sticks from China that are sold in the streets. Directions: Start to burn the tip of the stick, the flame blows and allow to smolder, filling the room with a fragrance. Quench with a drop of water when you feel that the room is filled with the aroma of your favorite Incense. A stick may be used as many times / 10 times /, and to be ignited, smolder and quench while wasting away completely. In India, and in all religious practices are used Incense in one form or another for cleaning the room from negative energies and flavoring it with incense. In Christianity are used incense with a base burning coals , in South America ignite dry aromatic herbs, in ancient Greece are sprinkled the holy rooms with rose water and essential oils / aroma lamps /. 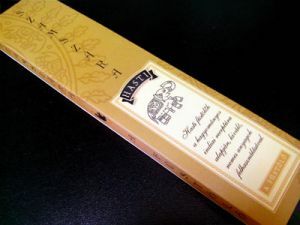 In India produce till nowadays in an ancient technology incense, as the basis of thin split, usually bamboo sticks are applied manually by rolling a special blend of sacred ingredients, fragrant herbs and essential oils. Thus the stick slowly smolder, releasing a specific beautiful and wonderful smoke flavor while changing the energy of the place where it is lit.